This is an alarm clock taken with a tripod, with about 3.5 seconds in the 11:59 PM position, then quickly moved to the final position in about 1.5 second's time, and left exposed for another 3 seconds at 12:00 AM. 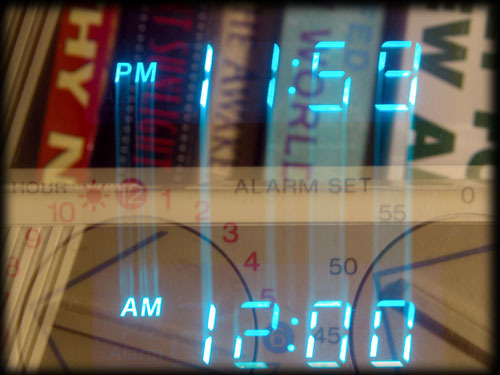 The actual time transition from 11:59 to 12:00 is during the physical transition as well! Settings: 8 second exposure, f5.4, matrix metering, f31.9mm focal length. Camera: Nikon Coolpix 5700. Original resolution: 2560x1920. Image parameters: 5 megapixel, 559kB. "Basic" setting - 16:1 jpg compreession.